For baseball traditionalists, the principles described in Michael Lewis’ great book Moneyball were an apostasy comparable to the Atkins’ diet, a rejection of decades of received wisdom. In detailing how Oakland A’s general manager Billy Beane fielded a competitive small-market team with less than a third of the New York Yankees’ payroll, Lewis notes a top-down shift in team-building philosophy. Suddenly, veteran scouts, with their unempirical observations, were cast aside in favor of Ivy League number-crunchers, and the longstanding value of sacrifice bunts and stolen bases gave way to the cult of on-base percentage and walks. It seems absurd on its face to convert Lewis’ tale of front-office wrangling into a sports movie, but Bennett Miller’s shrewd adaptation, scripted by Steven Zaillian and Aaron Sorkin, turns it into Major League for stats wonks. Once a hot prospect in his own right, compared favorably by some scouts to Darryl Strawberry, Beane was a draft bust, and as GM, his philosophy was simple: He never wanted any Billy Beanes playing for the Oakland A’s. Played by Brad Pitt as brash yet thoughtful, and almost recklessly eager to buck conventional wisdom, Beane enters the 2002 season having lost three of his best players to bigger markets. 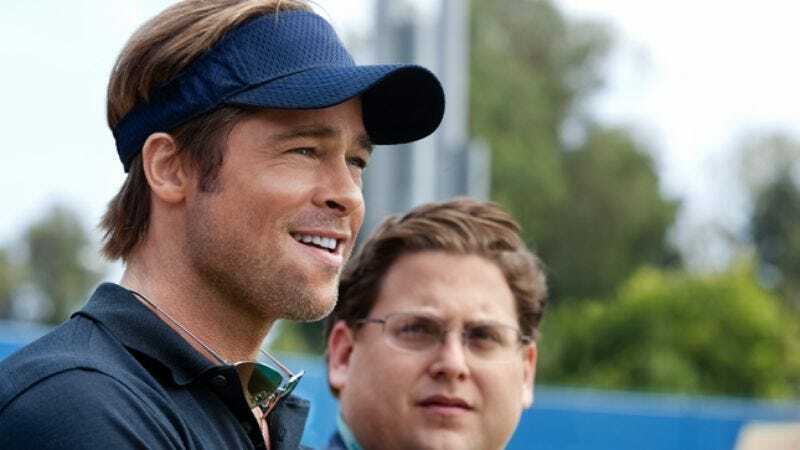 Bringing on young Yale sabermetrician Peter Brand (Paul DePodesta in real life, played here by Jonah Hill) as his assistant GM, Beane quickly recognizes that replacing a titanic hitter like Jason Giambi is impossible, so he sets about finding undervalued players who can make up the loss in numbers. (Brand calls them “an Island Of Misfit Toys.”) After a rough start, the team winds up back in playoff contention, culminating in a 20-game winning streak. There’s an irony embedded in that streak that Moneyball can’t bring itself to acknowledge: Running off 20 games straight is a statistical anomaly, and should be tossed out along with Beane’s own lingering superstitions. Yet the book and the film rebuff the notion that stats geeks can’t love the game like the purists, so when the A’s enjoy their underdog triumph, it’s consistent for the audience to enjoy it, too. Miller (Capote) directs with intelligence, though not flair, but the script makes up for any flagging energy with crackling Sorkin dialogue and performances that sing with revolutionary fervor. The cult of Billy Beane will remain a source of contention, especially now that his methods have become commonplace and his A’s have slumped into mediocrity, but Moneyball persuades as a rousing egghead triumph.